Did you know that BUGS does Birthday Parties? We do all the work! That’s right, we offer 1.5 hours of excitement, fun and gymnastics! You don’t have to be the Birthday monitor! We all know that it can be very difficult to invite kids to your home for a party and constantly protect your favorite lamp and white carpet. You have no mess to clean up! With a BUGS Birthday Party, when the party’s over, it’s over for you, too. No fuss. A BUGS Birthday Party can actually be less expensive than a home party! When you figure in all the incidental costs of a home party, including the expense of party favors, games, etc., you may spend more for a party at your home (especially if you have to call Stanley Steemer the Carpet Cleaner)! Our brand new BOUNCY HOUSE is now included in our party and you can add on the OBSTACLE COURSE to your already AWESOME BUGS party! So bring your party to BUGS.. See below for more details! Call 812-336-7469 to Reserve your Party! Price includes a full 1.5 hours of Gymnastics Fun & the BOUNCE HOUSE! We allow a maximum of 16 partygoers (12 if party-goers are 4-6 yrs old). 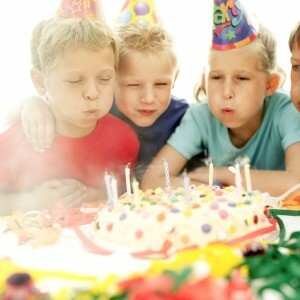 For a party of 17 or more, add $25 per 8 kids (per 6 kids for 4-6 year olds). You can add on the INFLATABLE OBSTACLE COURSE for an additional $25. A free BUGS T-Shirt for the birthday kid! Cupcakes or Cake, Drinks, Snacks, etc. What to Wear: Children should wear gym clothes (active wear). Arrival Time: You may arrive 30 minutes before your party begins. Please arrive no later than 10 minutes before your party is to begin. Departure Time: Party hosts are allowed 15 minutes following the party to allow for clean up. All party-goers must wait to enter the gym until the teachers have officially started the party. All children or adults who enter the gymnastics area must have a signed waiver on file with us. Please help us by following any and all instructions given by the BUGS staff. Any children who are not part of the party group must remain with parents in the viewing area.